Did you know there are 61 Banks operating in Canada? Banking is one of those life skills that nobody ever teaches you, and you’re left to sort through the barrage of banking propaganda and figure it out on your own, though most of us never really do. Of course it’s in our best financial interest to understand what’s going on with our accounts and what our options are. 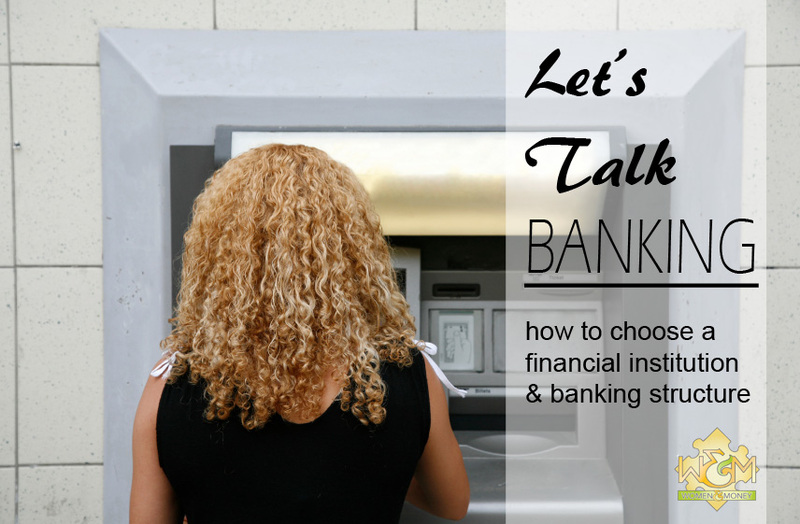 So we are going to talk about how to choose a bank and banking structure, and I have a few pieces of advice on the matter to share with you. Banking Structure: All-in-One or Multiple Institutions? These days, many banks have loyalty bonus programs which provide incentives for us to do all of our banking with them – chequing account, savings accounts, loans/lines of credit, mortgages, and investments such as RRSPs and RESPs. Your bank certainly benefits from this level of loyalty, and you may see the benefits in it as well – lower credit interest, higher savings interest, no banking fees, etc – but be wary of placing all of your eggs in one basket. When you place your money in the care of an institution that you also owe money to, that institution legally has the right to take your money to put against the loan, if you were to get behind on loan payments. As a general rule, I tell people not to “bank” (deposit your money) with any institution you that owe money to – be it a mortgage, car loan, student loan, line of credit etc. Another, perhaps obscure issue that has happened in the past, is that if anything were to happen to that one financial institution, you would be hooped. Banks have gone bankrupt (maybe not in Canada however), had all their assets frozen etc in a day, and if they have all of your eggs, that is a scary thought. It is a good idea to be a client in some form with several different Financial Institutions, building a rapport with them, so that you are able to easily access more financial products or credit (loans) if necessary. “Brick and Mortar” banks provide convenient access to cash, checks, money orders and personal services, while online banks can provide higher interest savings accounts and lower fees due to their lack of overhead, so why not take advantage of both formats to optimize your banking? Of course if you spread your bank accounts over several banks or financial institutions, you are creating more complexity for yourself — more logins/passwords, more physical locations, more time and complexity to account transfers, etc. However there are websites and apps which allow you to monitor all of your accounts in one simple screen. As well, putting a small barrier between yourself and your hard-earned savings may be a good thing if you have a tendency to overspend or use your savings on impulse. Whether you choose to do all of your banking with just one institution, or spread your bank accounts over several different companies, deciding which financial institution to employ should not be taken lightly. So many factors can affect your happiness with your choice, so take some time to make a well-informed decision. You might consider the institution’s reputation and longevity, their principles and ideology, rates and fees, proximity and ease of access (hours of operation) and more. Is there a physical location that is convenient for me to access? Do the hours of operation fit with my schedule? Does it provide easy and accessible telephone or online banking? What are the banking fees, and how do those compare to other banks? How do the credit interest or savings interest rates compare to other banks? Do the client services address your needs in a timely, professional and friendly manner? Is this institution recommended by its patrons? Another choice to make is traditional bank or credit union? If you are wondering how Credit Unions are different and what they have to offer, check out this great list by the Toronto Star: 10 reasons why credit unions are worth a look. However, Credit Unions are becoming more and more just like “Banks”, so do your homework. As a money coach and credit counsellor, I do not endorse one financial institution over another, my interest is in your best interest! There are many factors to consider when setting up or re-arranging the structure of your bank accounts. At the bare minimum you will need one checking account for everyday transactions, one high interest savings account, and one form of credit — be it a personal loan, line of credit, credit card, etc. Though it’s not necessary to have a credit account, it is a good idea to help establish your credit rating (credit worthiness) which will provide lower interest rates and better options available to you when you need credit (such as a car loan or mortgage). Much debate can be found on a more complex bank account structure, involving 2, 3 or more checking accounts and several savings accounts for different purposes. Rather than delve into this topic here, we’ll encourage you to read some popular opinions out there and remember to do what works best for you — no one solution works for everyone and it really depends on your personal situation as to how to specifically structure your bank accounts. Let’s not forget, you should have some type of long term investment account that will earn much higher interest over time than a savings account. This is very important for retirement savings, education savings for your children, and other long-term, large expenses. There are RRSPs, TSFAs and RESPs regulated by the government, and each can be funneled into different types of investments such as savings, GICs (Guaranteed Investment Income), Mutual Funds etc. You can also have GICs, Mutual Funds, Money Market Funds, and Stocks through banks/credit unions and licensed financial planners/advisors. These accounts all form your investment portfolio. Again, this is a huge topic which has a wealth of information online, so do some research into investment strategies and information before jumping into something. Do not bother investing when you have high-interest debt. And do not acquire new debt in order to invest. Your investment will never have as high return as the interest and fees you will pay on your debt, so paying off the debt should be your first priority. Debt freedom is the only way to be wealthy, so aim to be consumer debt free as soon as possible, and completely debt free by retirement. If you are struggling to keep up with your credit card payments or other bill payments, get help from a licensed credit counsellor at Solutions Credit Counselling Service Inc. 1.877.588.9491 or contact Women & Money Inc. — 1.877.944.9980. Financial institutions will sometimes offer “gifts” or introductory rates to entice you to sign up, and these may well be beneficial to you, but always do your research and read the fine print before signing on the dotted line. And be aware that each credit check performed to your personal credit report (when you apply for any form of credit) will negatively affect your credit rating. So, think twice about applying for a credit card you don’t need just to get that free item.